The night of January 1 was the first this year the super moon. The moon at the point of its orbit closest to the Earth is 8% wider and 16% brighter than the average. This means that it’s time for the lunar halo. One of these phenomena captured Eliot Herman in Arizona, USA. 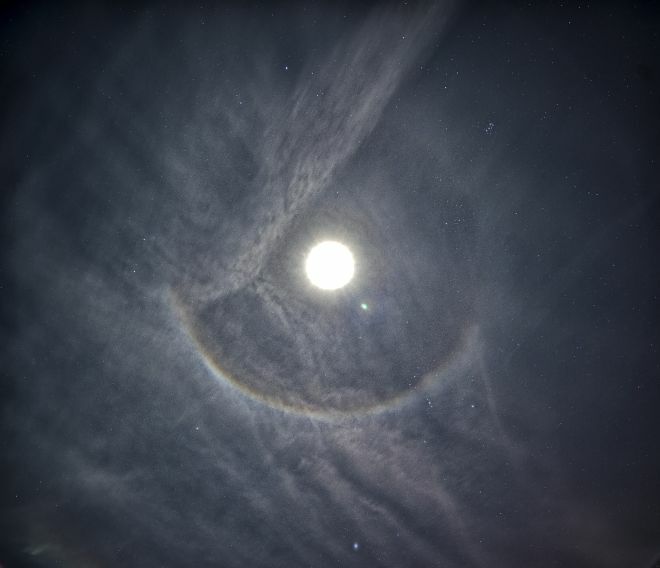 “Light cloudiness slightly spoiled the picture, but in general I managed to catch the starry sky and the moon halo,” Herman says. The round glow in the photo was caused by the refraction of ice crystals in the frosty air over the city of Tucson. The full moon is called a super moon, when the Earth’s satellite is in perigee. Superluns especially often generate different halos in the form of light columns, luminous rings or false moons.